Animal models of atherosclerosis are essential to understand the mechanism and to investigate newer approaches to prevent plaque development or rupture, a leading cause of death in the industrialized world. This protocol uses a combination of balloon injury and cholesterol rich diet to induce atherosclerotic plaques in rabbit iliac artery. Jain, M., Frobert, A., Valentin, J., Cook, S., Giraud, M. N. The Rabbit Model of Accelerated Atherosclerosis: A Methodological Perspective of the Iliac Artery Balloon Injury. J. Vis. Exp. (128), e55295, doi:10.3791/55295 (2017). Acute coronary syndrome resulting from coronary occlusion following atherosclerotic plaque development and rupture is the leading cause of death in the industrialized world. New Zealand White (NZW) rabbits are widely used as an animal model for the study of atherosclerosis. They develop spontaneous lesions when fed with atherogenic diet; however, this requires long time of 4 - 8 months. To further enhance and accelerate atherogenesis, a combination of atherogenic diet and mechanical endothelial injury is often employed. The presented procedure for inducing atherosclerotic plaques in rabbits uses a balloon catheter to disrupt the endothelium in the left iliac artery of NZW rabbits fed with atherogenic diet. Such mechanical damage caused by the balloon catheter induces a chain of inflammatory reactions initiating neointimal lipid accumulation in a time dependent fashion. Atherosclerotic plaque following balloon injury show neointimal thickening with extensive lipid infiltration, high smooth muscle cell content and presence of macrophage derived foam cells. This technique is simple, reproducible and produces plaque of controlled length within the iliac artery. The whole procedure is completed within 20 - 30 min. The procedure is safe with low mortality and also offers high success in obtaining substantial intimal lesions. The procedure of balloon catheter induced arterial injury results in atherosclerosis within two weeks. This model can be used for investigating the disease pathology, diagnostic imaging and to evaluate new therapeutic strategies. Rupture of vulnerable atherosclerotic plaques is one of the leading causes of death in the industrialized nations1. Although research over the past decades has unfolded several molecular and cellular mechanisms involved in plaque progression, continued efforts are still needed not only to unravel the complex mechanism of disease progression but also to test new therapeutic approaches. Several animal models have been proposed to study the atherosclerosis. Genetic manipulation, cholesterol feeding or mechanical endothelium injury are the standard strategies shared by most animal models of atherosclerosis including mice, rabbits or minipigs. Among these, NZW rabbits are sensitive to cholesterol diet while normal rats and mice do not significantly absorb dietary cholesterol2,3,4. Rabbits spontaneously develop aortic lesions rich in macrophages with some fibrous component when fed with cholesterol rich diet5,6. However, the long preparatory time of 4-8 months to induce atherosclerotic plaquesby feeding cholesterol diet alone6,7 is a major drawback for most of the experimental settings. In pursuit for inducing lesions in relatively short time, a combination of high cholesterol diet and balloon injury has been developed by Baumgarter and Studer8. The overall goal of this technique is to induce atherosclerotic plaques composed of foam cells (similar to fatty streak in humans) in hypercholesterolemic rabbits within 2 weeks. The present technique describes the procedure of arterial wall injury based on Baumgarter's method using a balloon catheter advanced into the iliac artery of NZW hypercholesterolemic rabbits. Together with a cholesterol rich diet, injury resulting from balloon induced de-endothelialization will lead to atherosclerosis. Balloon injury accelerates the formation of atherosclerotic lesions, and produces plaque of uniform size and distribution. Intimal thickening increases over a period of time and intimal cell infiltration starts within few days following injury. Fatty streaks with substantial macrophages start to appear after 7 - 10 days of balloon injury and are represented as Type II lesion according to the classification by American Heart Association. Balloon injury in rabbit is often performed in the aorta to study plaque composition. The neointimal endothelium expresses high levels of intercellular adhesion molecule. The plaques are associated with medial dissection and adventitial changes. Atherosclerotic lesions are composed of lipids, proliferating smooth muscle cells (SMCs), collagen fibers and inflammatory cells that accumulate under the regenerated endothelium and are mostly type II in nature. The topological distribution of rabbit plaques was similar to that reported in human aortas 9,10 In principle, the aorta is larger in size compared to iliac arteries and would produce plaque in larger length. However, the major advantage of using the iliac artery as the site of atherosclerosis in rabbits is its accessibility, its similarity in muscular content to human coronary artery11, uniform lesion development12, high tissue factor activity13 and consistent vessel dimension comparable to human coronary artery allowing the evaluation of commercially manufactured devices to morphometric and angiographic endpoints. Invasive and non-invasive methods have been investigated to analyze the plaques in rabbit iliac arteries in the live animal. Previous reports describe the use of magnetic resonance imaging (MRI) with the help of a 2.35-tesla MR system 14 Additionally, intravascular ultrasound (IVUS) or optical coherence tomography (OCT) catheters can be suitably applied to image atherosclerotic plaques in rabbit iliac arteries. The iliac artery is accessible for ultrasound imaging when using a high-resolution echography and the aorta can also be explored with this technique. In the past decade, this rabbit model of balloon injury has helped to further understand the mechanisms of plaque progression15and plaque regression16. In addition, the model has been used to study the influence of novel therapeutic agents such as statins, standard antiplatelet agents, antioxidant agents17,18 and drug-eluting stents such as everolimus or zotarolimus-eluting stent19,20 on neointimal thickening. This model has also been used to investigate intravascular imaging of near-infrared fluorescence imaging catheter21. This experimental protocol has been approved by the Cantonal Veterinary Office, Fribourg and the Swiss Federal Veterinary Office, Switzerland (FR 2015/58). NOTE: Male NZW rabbits weighing between 2.8 to 3.2 kg were used. The animals were housed under conventional conditions (12 h light and dark cycle, provided ad libitum water and food). Prior to balloon denudation, animals were acclimated for 1 week during which they were fed with normal chow diet. After 1 week of acclimatization, rabbits were switched to atherogenic diet consisting of high fat (8.6%), and saturated fatty acids with 205 mg/kg cholesterol (1%) diet for the whole study duration. Balloon injury in the left iliac artery was performed 1 week after diet initiation and animals were sacrificed after 2 weeks or 4 weeks of balloon injury. Sterilize all surgical instruments before use with a glass bead sterilizer or other suitable instrument. Prepare and check the balloon catheter assembly. Attach a 1 mL luer lock syringe filled with normal saline to the luer-lock part of the balloon catheter. Carefully monitor for absence of trapped air. Check the leaks and ensure proper balloon inflation by pressing the plunger of the syringe. Weigh the rabbit and turn on the thermopad to 37 °C. Use a buprenorphine solution at a concentration of 0.3 mg/ml. Inject a dose of 0.01 mg/kg subcutaneously. Anesthetize the rabbit with 5% isoflurane and 5 L/min O2 in an induction chamber for 10 - 15 min. Place the anesthetized rabbit on the heating pad kept on the surgical platform. Place the patch and clips to monitor the temperature, respiration, and electrocardiogram. Attach the snout of the rabbit to a face mask connected to a suitable anaesthesia machine. Maintain the anaesthesia with isoflurane (4.0% with 2.5 L/min O2). Confirm proper anesthetization (indicated by lack of muscle tone and loss of gag and pinnae reflexes). Apply ophthalmic ointment to both eyes to prevent the corneas from drying. Drape the rabbit with a sterile surgical sheet with only the lower limb exposed. Remove the hair from the ventral area just below the knee joints using animal hair clippers. Swab the area with suitable disinfectant to clean the skin and remove loose hair. Locate the saphenous artery and make a small skin incision of about 1.5 cm in length using a scalpel. Expose a small portion of saphenous artery with small curved forceps without damaging the femoral vein and femoral nerve. Place two loose ligature loops (5-0 silk) beneath the saphenous artery and tie one ligature loop towards the distal end of the artery. Place a microvascular clamp above the ligature to stop the blood flow from the iliac artery. Topically apply one drop of papaverine to dilate the artery and to prevent vasospasm. Lift up the saphenous artery with the help of the tied ligature and make a small arteriotomy incision using a 24 gauge needle. Elevate the incision flaps with fine forceps and slowly insert a vein pick or a guiding needle into the lumen of the artery. Insert a 2 French Fogarty arterial embolectomy catheter into the saphenous artery. Remove the vein pick and microvascular clamps. Advance the catheter till the sixth mark (20 - 25 cm) corresponding to a position roughly 2-5 cm above the iliac bifurcation. Inflate the balloon with 0.1 mL normal saline using a 1 mL syringe or at a nominal pressure of 6 atm using a regulated manual inflator as described in 16,22. Hold the balloon catheter with forceps and drag back by 6 cm through the iliac arterytoward the point of insertion, while rotating the catheter. Deflate the balloon by pulling back the plunger of the syringe. Repeat steps 2.10 to 2.13 three times to ensure complete endothelial denudation. Remove the catheter and immediately tie the ligature loop just above the arteriotomy site to stop bleeding. Apply suitable antiseptic all around the periphery of the wound and swab away the blood clots. Close the skin incision with a 5-0 suture, and disinfect the surgery site with povidone-iodine solution. Repeat steps 2.1 to 2.16 on the contralateral iliac using a new catheter. Swab the ophthalmic ointment from eyes. Administer sulfadoxine 40 mg/kg and trimethoprim 8 mg/kg or any other suitable antibiotic immediately after the surgical procedure. During the anesthesia-recovery period, keep the rabbit over a heat pad placed in a clean autoclaved cage. Remove the monitoring patch and clips. After recovery, return the rabbits to their home cages. Inject subcutaneously buprenorphine 0.05 - 0.1 mg/kg post -operatively every 6 - 12 h for 48 h. Continue atherogenic diet for another two weeks or four weeks. After two weeks (for early thin plaque) or three weeks of balloon injury, anesthetize the rabbit using isoflurane in a similar way as described above. Open the thoracic cavity and euthanize the rabbits by intracardial exsanguination. Isolate the iliac arteries as described in 23. Briefly, open the abdomen and expose the retroperitoneum. Trace the aorta towards the iliac bifurcation and tie it above the bifurcation. Carefully remove the surrounding tissues to expose and isolate both iliac arteries. Dissect out both iliac arteries and immerse them in ice-cold phosphate buffered saline. Remove the clots with the help of forceps. Divide each iliac artery into 4 - 6 segments to characterise the thickness of the plaque throughout the artery. Immediately embed the arterial segments in a mold containing optimum cutting temperature compound, snap-freeze using liquid nitrogen and keep it at -70 °C. Prepare 5 µm thick sections using a cryostat as described in 24. Perform histology, immunofluorescence or immunohistochemical staining for morphometry, plaque lipid and cellular content as described in 10,25. NOTE: Briefly, rinse the arterial sections with phosphate buffered saline (PBS) and permeabilize using 0.2 % Triton. Rinse the sections with PBS and block non specific sites with 2% bovine serum albumin for 30 min. Incubate the sections for 1 h at 37 °C with anti α-SM actin (1:200) or RAM11 antibody (1:200). Rinse the sections with PBS and incubate them with appropriate secondary antibody for 30 min at 37 °C. Wash again with PBS and add Hoechst (5 µg/mL) for 10 min to detect nuclei. Balloon injury of the iliac artery was performed successfully without complication (Figure 1). The total operative time ranged from 20 to 30 min for injuries performed on only one iliac artery, and 35 to 45 min for injuries on both arteries. The rabbit recovered within 1 h after balloon injury. All animals appeared healthy without significant weight loss. No infection, oedema or arterial thrombosis was encountered. The wound area was normal besides some mild fibrosis at the suture site. Following 4-weeks of atherogenic diet feeding, rabbits exhibited hypercholesterolemia of 44 ± 18 mM/l. Figures 2A, Figure 2E, and Figure 2I show the right uninjured iliac artery (not subjected to balloon injury) with a normal appearance. 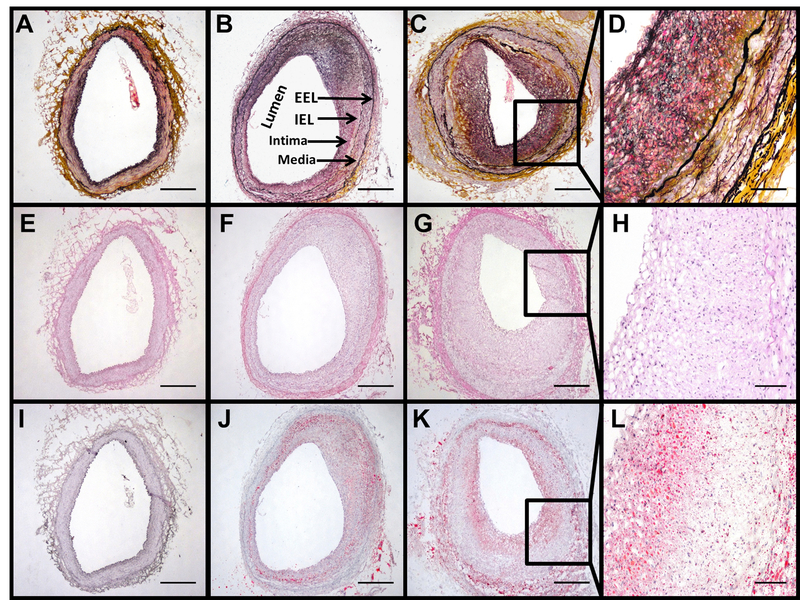 A combination of balloon injury and cholesterol dietresulted into structural changes of the vessel wall leading to the development of atherosclerotic plaque in two weeks (Figure 2 and Figure 3). The uninjured and balloon injured iliac arteries for were isolated from the same animal. The proliferative vascular response to balloon injury as a triggering event resulted in extensive lipid infiltration (8.7 ± 1.7 % lipid area) (Figure 2 and Figure 3), smooth muscle cell migration and proliferation (Figure 4), as well as recruitment of macrophages (Figure 4) leading to an increase in intima-media thickness ratio (1.5 ± 0.2), and plaque area (0.8 ± 0.2 mm2) with a concomitant decrease in lumen area (1.4 ± 0.2 mm2) (Figure 3) observed 2 weeks after balloon injury. RAM-11 is a monoclonal antibody that is specifically targeted against the cytoplasm of rabbit macrophages. 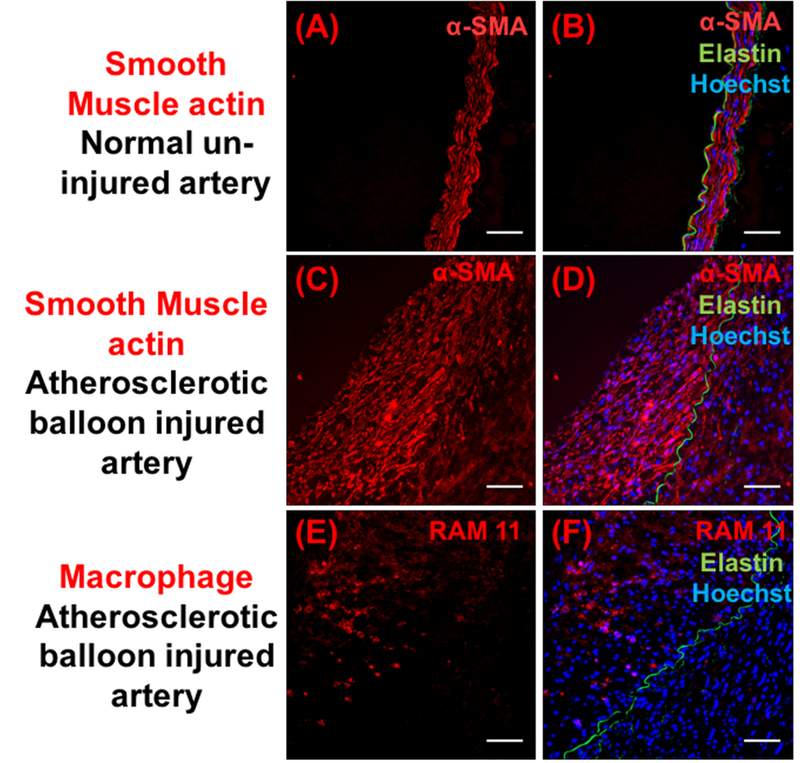 α-SM actin identifies muscle actin and reacts with vascular smooth muscle cells in blood vessels. These antibodies have been previously used to study macrophage and smooth muscle cell in the intimal lesions of the rabbit. These changes continued to evolve with time and a further increase in intima/media thickness ratio (2.6 ± 0.2) and luminal narrowing (0.7 ± 0.1 mm2) (Figure 2 and Figure 3) was noted 4 weeks after balloon injury. This technique leads to the robust development of atherosclerotic plaques that develops over time and was studied after 2 to 4 weeks. Figure 1: Schematic Representation Illustrating the Timeline of Plaque Progression Following Balloon Injury. Please click here to view a larger version of this figure. Figure 2: Balloon Injury Induced Atherosclerosis in Rabbit Iliac Artery. Representative images of Movat pentachrome (A-D), Hematoxylin-Eosin (E-H) and Oil red O (I-L) stained sections from the un-injured (A, E, I), 2 weeks post balloon injury (B, F, J) (n=5) and 4 weeks post balloon injury (C, G, K) (n=3) iliac artery segments of atherogenic diet fed NZW rabbits. Scale bar for D, H and L is 100 µm. Scale bar for the other images= 500 µm. Labelled in the image B is the lumen, intima, IEL (Internal elastic lamina) and EEL (External elastic lamina). Media is the area between IEL and EEL. Please click here to view a larger version of this figure. Figure 3: Morphometric Analysis of the Plaque. The scatter plot shows intima/media thickness ratio, plaque area, lumen area and % Oil red O positive area in iliac artery sections from un-injured control, balloon injured artery at 2 (n= 5) and 4 weeks (n= 3). Data are shown as mean ± SD. 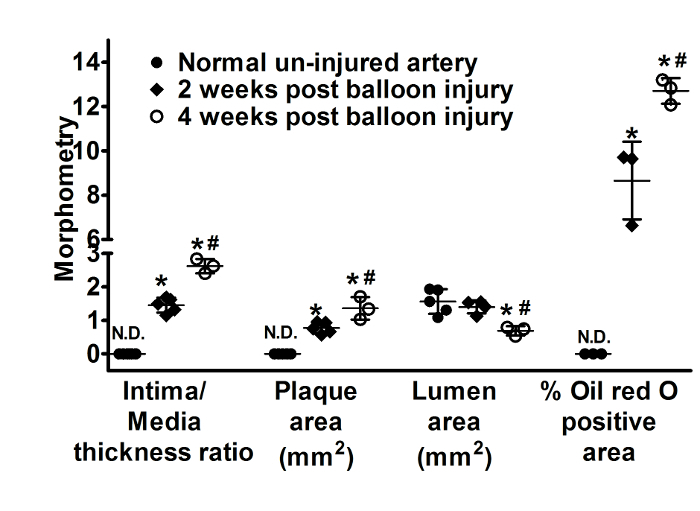 *p< 0.05 vs un-injured artery, #p< 0.05 vs 4 weeks post balloon injury. N.D. denotes not detected. Plaque area is calculated by subtracting the lumen area from the IEL area while Oil red O positive area represents % of the total cross-sectional vessel wall area. Please click here to view a larger version of this figure. Figure 4: Immunohistochemical Analysis of the Plaque Composition. Representative images showing α-smooth muscle actin (red) (A-D) and macrophage (RAM 11) positive cells (red) (E-F). Right panels show the respective merged images with Hoechst (blue) and elastin (green). Scale bar = 100 µm. Please click here to view a larger version of this figure. The rabbit iliac artery atherosclerosis model is widely used in atherosclerosis research. With this protocol the rabbits rapidly developed more severe and advanced plaques as compared to spontaneous lesions developed with only cholesterol diet. Importantly, animals recover quickly from the surgery. The main stimulus for atherogenesis is the mechanical damage caused by the balloon catheter that injures the endothelium and distends the vessel wall26. This procedure induces a remodelling response characterized by an inflammation with macrophage recruitment and lipid accumulation when associated with hypercholestorolemic diet, vascular smooth muscle cell migration and proliferation, enhanced matrix synthesis, and establishment of an invasive neointima in a time dependent fashion15,16. Inserting the balloon catheter is the most critical part of the procedure. Caution must be exercised to avoid forcefully inserting the balloon. The use of peripheral saphenous artery to access the common iliac artery simplifies the technique. Iliac artery can also be accessed via carotid artery cut-down as described previously27,28. However, assessing the iliac artery via carotid artery requires a high degree of surgical expertise and additional equipment such as an angiography unit. It is also associated with procedure-related complications like injury to the jugular vein leading to fatal haemorrhage29. Use of topical vasodilator such as papaverine helps to dilate the vessel and reduce the resistance of the arterial wall against the balloon catheter30. The inflation pressure and balloon size must be carefully considered as these have a direct association on neointimal formation31. Over-distension of the balloon to a higher degree than desired levels could lead to rupture of the vessel wall. This might result in leaking of blood and robust thrombus formation both in the lumen and on the outer surface26. The animals must be fed a lipid rich diet for 1 or 2 weeks prior to balloon injury to ensure that endothelial injury occurs in a hypercholesterolemic setting. It also helps the animals to adapt to the new diet. Although this technique induces advanced plaques in rabbits, the morphology of the plaques differs from that observed in humans. The spontaneous human lesions are restricted to the sub-endothelial region with an intact internal elastic layer32.Here, the studies carried out till 4 weeks showed no fibrotic cores. The atherosclerotic lesion remains similar to fatty streak with substantial macrophage infiltration. Many small and large animal models have been used for understanding atherogenesis6. The balloon-injury rabbit iliac artery model has been used to study the effect of new therapeutic agents, novel drug delivery systems, plaque evolution and imaging10,32,33.Single or multiple balloon injurieshave been performed in the iliac artery34,35, carotid artery36,37,and aorta10,38. The advantages of the presented method are the development of large plaque volume and thickness as compared to use of carotid artery. In addition, the contralateral iliac can be used as a control and therefore reduces inter-animal variability29. The balloon injury in rabbit iliac arteries can be performed safely and easily using the method described here. Plaque develops in a time dependent fashion and is homogenous throughout the length of the artery. 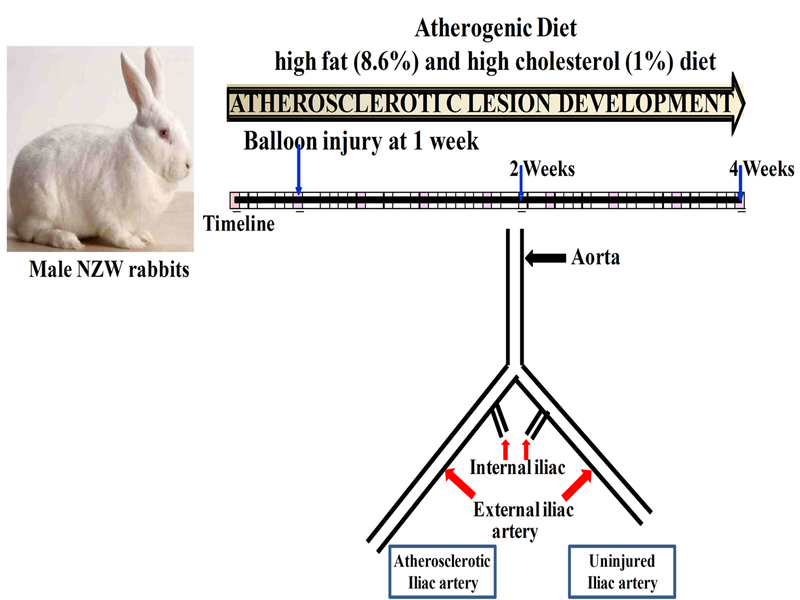 Other atherosclerotic rabbit models have also been developed such as the Watanabe heritable hyperlipidemic (WHHL) model, a genetically modified animal model with low density lipoprotein receptor deficiency. The balloon injury model can also be applied to WHLL rabbit to produce lesions at a defined site. There are differences between rabbit iliac artery and human coronary plaques. Indeed, several alternative procedures have been established in an attempt to develop advanced atherosclerotic lesions and to create a model of plaque rupture as observed in humans39. For example, unstable plaque formation was induced by eliminating the cholesterol diet after 8 weeks in rabbits that underwent balloon injury16. Other modified procedures use pharmacological triggers such as Russell's viper venom10 and subsequent repeated balloon injury40to evaluate the mechanism of plaque rupture, thrombogenesis and thrombus growth in atherosclerotic vessels. Russell's viper venom contains proteases that activate the coagulation cascade leading to thrombosis. Repeated balloon injury results into thrombin generation by plaque tissue factor40. It should be noted that the animal models results including the rabbit model may not perfectly extrapolate to humans. However, these models may be a useful tool for assessing and comparing the efficacy of new pharmacological interventions. Careful extrapolations must be made in relation to the degree of hypercholesterolemia and plaque composition to broaden the knowledge on the etiology, pathophysiology, and treatment of human atherosclerosis. The model presented here helps to study the mechanisms involved in plaque evolution and investigate the effect of new anti-atherosclerotic therapies directed towards plaque stabilisation/regression. This work was supported by the Swiss National Science Foundation Grant 150271. Alexa Fluor 488/547 Abcam, UK. Mozaffarian, D., et al. Heart disease and stroke statistics--2015 update: a report from the American Heart Association. Circulation. 131, e29-e322 (2015). Boone, L. R., Brooks, P. A., Niesen, M. I., Ness, G. C. Mechanism of resistance to dietary cholesterol. J Lipids. 2011, 101242 (2011). Kapourchali, F. R., et al. Animal models of atherosclerosis. World J Clin Cases. 2, 126-132 (2014). Carter, C. P., Howles, P. N., Hui, D. Y. Genetic variation in cholesterol absorption efficiency among inbred strains of mice. J Nutr. 127, 1344-1348 (1997). Kolodgie, F. D., et al. Hypercholesterolemia in the rabbit induced by feeding graded amounts of low-level cholesterol. Methodological considerations regarding individual variability in response to dietary cholesterol and development of lesion type. Arterioscler Thromb Vasc Biol. 16, 1454-1464 (1996). Singh, V., Tiwari, R. L., Dikshit, M., Barthwal, M. K. Models to study atherosclerosis: a mechanistic insight. Curr Vasc Pharmacol. 7, 75-109 (2009). Dornas, W. C., Oliveira, T. T., Augusto, L. E., Nagem, T. J. Experimental atherosclerosis in rabbits. Arq Bras Cardiol. 95, 272-278 (2010). Baumgartner, H. R., Studer, A. [Effects of vascular catheterization in normo- and hypercholesteremic rabbits]. Pathol Microbiol (Basel). 29, 393-405 (1966). Tanaka, H., et al. Sustained activation of vascular cells and leukocytes in the rabbit aorta after balloon injury. Circulation. 88, 1788-1803 (1993). Phinikaridou, A., Hallock, K. J., Qiao, Y., Hamilton, J. A. A robust rabbit model of human atherosclerosis and atherothrombosis. J Lipid Res. 50, 787-797 (2009). Nakazawa, G., et al. Drug-eluting stent safety: findings from preclinical studies. Expert Rev Cardiovasc Ther. 6, 1379-1391 (2008). Aikawa, M., et al. Lipid lowering by diet reduces matrix metalloproteinase activity and increases collagen content of rabbit atheroma: a potential mechanism of lesion stabilization. Circulation. 97, 2433-2444 (1998). Jeanpierre, E., et al. Dietary lipid lowering modifies plaque phenotype in rabbit atheroma after angioplasty: a potential role of tissue factor. Circulation. 108, 1740-1745 (2003). Durand, E., et al. Magnetic resonance imaging of ruptured plaques in the rabbit with ultrasmall superparamagnetic particles of iron oxide. J Vasc Res. 44, 119-128 (2007). Stadius, M. L., et al. Time course and cellular characteristics of the iliac artery response to acute balloon injury. An angiographic, morphometric, and immunocytochemical analysis in the cholesterol-fed New Zealand white rabbit. Arterioscler Thromb. 12, 1267-1273 (1992). Khanna, V., et al. Cholesterol diet withdrawal leads to an initial plaque instability and subsequent regression of accelerated iliac artery atherosclerosis in rabbits. PLoS One. 8, e77037 (2013). Zou, J., et al. Effect of resveratrol on intimal hyperplasia after endothelial denudation in an experimental rabbit model. Life Sci. 68, 153-163 (2000). Li, M., Zhang, Y., Ren, H., Zhang, Y., Zhu, X. Effect of clopidogrel on the inflammatory progression of early atherosclerosis in rabbits model. Atherosclerosis. 194, 348-356 (2007). Nakazawa, G., et al. Evaluation of polymer-based comparator drug-eluting stents using a rabbit model of iliac artery atherosclerosis. Circ Cardiovasc Interv. 4, 38-46 (2011). Van Dyck, C. J., et al. Resolute and Xience V polymer-based drug-eluting stents compared in an atherosclerotic rabbit double injury model. Catheter Cardiovasc Interv. 81, E259-E268 (2013). Abran, M., et al. Validating a bimodal intravascular ultrasound (IVUS) and near-infrared fluorescence (NIRF) catheter for atherosclerotic plaque detection in rabbits. Biomed Opt Express. 6, 3989-3999 (2015). Kanamasa, K., et al. Recombinant tissue plasminogen activator prevents intimal hyperplasia after balloon angioplasty in hypercholesterolemic rabbits. Jpn Circ J. 60, 889-894 (1996). Pai, M., et al. Inhibition of in-stent restenosis in rabbit iliac arteries with photodynamic therapy. Eur J Vasc Endovasc Surg. 30, 573-581 (2005). Fischer, A. H., Jacobson, K. A., Rose, J., Zeller, R. Cryosectioning tissues. CSH Protoc. 2008, (2008). Chaytor, A. T., Bakker, L. M., Edwards, D. H., Griffith, T. M. Connexin-mimetic peptides dissociate electrotonic EDHF-type signalling via myoendothelial and smooth muscle gap junctions in the rabbit iliac artery. Br J Pharmacol. 144, 108-114 (2005). Zhang, W., Trebak, M. Vascular balloon injury and intraluminal administration in rat carotid artery. J Vis Exp. (94), (2014). Maillard, L., et al. Effect of percutaneous adenovirus-mediated Gax gene delivery to the arterial wall in double-injured atheromatous stented rabbit iliac arteries. Gene Ther. 7, 1353-1361 (2000). Sharif, F., et al. Gene-eluting stents: adenovirus-mediated delivery of eNOS to the blood vessel wall accelerates re-endothelialization and inhibits restenosis. Mol Ther. 16, 1674-1680 (2008). Lee, J. M., et al. Development of a rabbit model for a preclinical comparison of coronary stent types in-vivo. Korean Circ J. 43, 713-722 (2013). Tulis, D. A. Rat carotid artery balloon injury model. Methods Mol Med. 139, 1-30 (2007). Asada, Y., et al. Effects of inflation pressure of balloon catheter on vascular injuries and subsequent development of intimal hyperplasia in rabbit aorta. Atherosclerosis. 121, 45-53 (1996). Waksman, R., et al. PhotoPoint photodynamic therapy promotes stabilization of atherosclerotic plaques and inhibits plaque progression. J Am Coll Cardiol. 52, 1024-1032 (2008). Fernandez-Parra, R., et al. Pharmacokinetic Study of Paclitaxel Concentration after Drug-Eluting Balloon Angioplasty in the Iliac Artery of Healthy and Atherosclerotic Rabbit Models. J Vasc Interv Radiol. 26, 1380-1387 (2015). Dussault, S., Dhahri, W., Desjarlais, M., Mathieu, R., Rivard, A. Elsibucol inhibits atherosclerosis following arterial injury: multifunctional effects on cholesterol levels, oxidative stress and inflammation. Atherosclerosis. 237, 194-199 (2014). Manderson, J. A., Mosse, P. R., Safstrom, J. A., Young, S. B., Campbell, G. R. Balloon catheter injury to rabbit carotid artery. I. Changes in smooth muscle phenotype. Arteriosclerosis. 9, 289-298 (1989). Miyake, T., et al. Prevention of neointimal formation after angioplasty using nuclear factor-kappaB decoy oligodeoxynucleotide-coated balloon catheter in rabbit model. Circ Cardiovasc Interv. 7, 787-796 (2014). Fulcher, J., Patel, S., Nicholls, S. J., Bao, S., Celermajer, D. Optical coherence tomography for serial in vivo imaging of aortic plaque in the rabbit: a preliminary experience. Open Heart. 2, e000314 (2015). Abela, O. G., et al. Plaque Rupture and Thrombosis: the Value of the Atherosclerotic Rabbit Model in Defining the Mechanism. Curr Atheroscler Rep. 18, 29 (2016). Yamashita, A., Asada, Y. A rabbit model of thrombosis on atherosclerotic lesions. J Biomed Biotechnol. 2011, 424929 (2011).